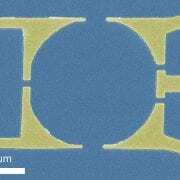 The fractional quantum Hall effect (FQHE) occurs in a two-dimensional electron gas (2DEG) subjected to a perpendicular magnetic field at low temperature. 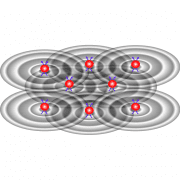 It is now understood to arise from strong electron-electron interactions. In transport experiments the FHQE is characterized by Hall resistance quantized to rational fractional values of h/e2 and vanishingly small longitudinal resistance. 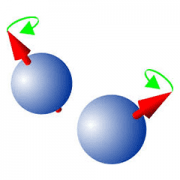 Quasi-particle excitations in the FQHE are called anyons. A major thrust in the Quantum Semiconductor Systems group is growth of extremely high quality GaAs/AlGaAs heterostructures. 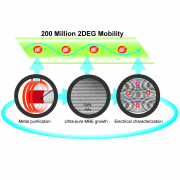 One metric of quality is 2D mobility, which can now exceed 30 x 106 cm2/Vs at low temperatures. At low temperature mobility is limited by imperfections in the grown sample. Imperfections include intentionally introduced charged impurities, unintentional background charged impurities and structural defects. Our efforts are focused in 3 areas: improved MBE vacuum conditions, source material purity, and heterostructure design. 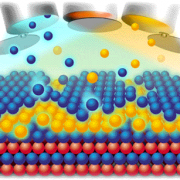 Our work in the III-Nitride material system is focused on exploiting its unique physical properties to produce novel light sources based on intersubband transitions. Due to the large conduction band offsets available in Al(In)GaN/GaN heterostructures, intersubband transitions can span the technologically important near-IR (~1.5microns) to far-IR (~100microns) spectral range.